They often hang around the same area and their parents start training them to be independent and push them to start foraging for their own food. Their parents will leave them occasionally to gather food for them. So the parents can be gone for any number of days before they return to feed them. During this critical learning period, these tiny creatures are often picked up by concerned passers-by as they hear them crying and they think they are in distress. They are usually crying out for their parents and their parents may be close by or off somewhere gathering some food for them. If you happen to be one of those passers-by, I commend you for caring enough to take notice of those beautiful creatures. But before you dive in and pick up one up, step back and look around. You must browse the premises and check if you can spot a nest or hollow in one of the nearby trees or any adult birds hovering around the vicinity. If the tiny bird is in no direct danger of being run over or predated on, then please don’t pick it up just yet. If the little one is moving around freely and you have spotted a nearby nest/hollow or adult bird, then leave it alone. It is best to monitor its movements instead. Come back and checkup on it in a few hours and again in 12 hours. If the little one still appears to be unattended or seems to be getting weaker, then by all means, it is time for an intervention. Pick up your phone and dial the wildlife help line number and get some appropriate advice on the next step. 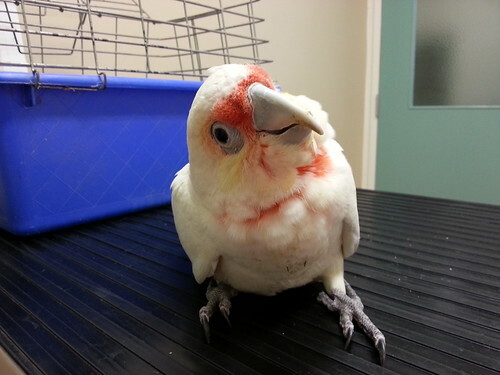 They usually request you drop in the bird to the closest vet clinic for a check-up. All veterinary clinics treat wildlife pro-bono which means it won’t cost you a thing. Just pop the feathery little one in a box and hand it over to the veterinary staff. It will be assessed and treated if necessary and a wildlife carer will be contacted to pick it up and provide for its ongoing care. Please do not feed the bird unless you have been given specific instructions from a licensed wildlife carer. You can cause more harm than good if you feed the bird an inappropriate diet. 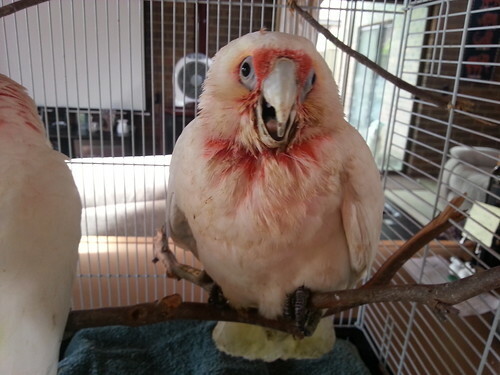 Looking after a young bird is not a walk in the park and requires an expert to do it. Wild birds do not live on seed mixes and so it is useless offering these birds such diets. 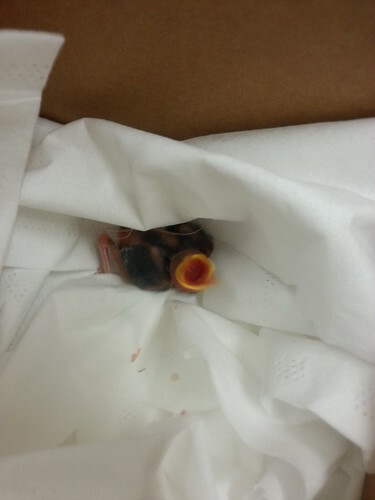 Here I am crop feeding a baby corella that I was brought into the clinic. I took it home along with another older fledgling as a wildlife carer was going to pick it up the next day. This video was taken the morning I was scheduled to send the babies off to a wildlife care. T I was already quite attached to them but I knew deep down I was doing what’s best for them. Loved teasing the cheeky and noisy little one. In other situations, immature birds or nestlings are blown out of their nest. They barely have any feathers and have paper-thin see through skin and are quite difficult to identify. If you see any of these fragile beings on the ground, you must take action. The best first approach is to find their nest and try to put them back in it if it is physically possible. Otherwise, you must create a make shift nest consisting of a plastic container lined up with straw or paper towels and pin it to the nearest tree. The parents should usually come back and start to feed it. It is best if you observed the little critter over the next 12-24 hours to confirm that its mom has come back to feed it. If there is no activity around the make shift nest, then you need to bring them into the nearest veterinary clinic. 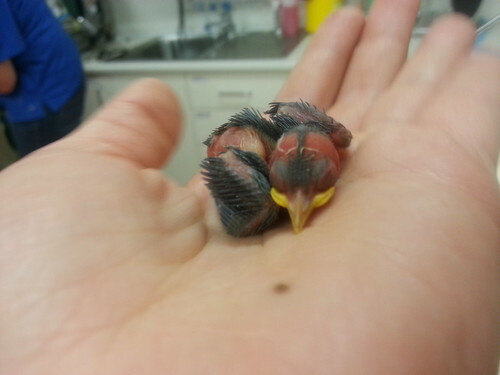 Unfortunately, if they are found to be way too young for a wildlife carer to rear then they will humanely be put down. On most occasions, we leave that decision for the wildlife carers to make as they are the experts in that area. Euthanasia is still a far better outcome then being starved to death or predated on by another animal if they are left unattended. Often I find these little birdies inspire the public to adopt them and turn them into family pets. Honestly, whilst I totally understand the maternal strings these birds can tug on, I don’t think it is the right thing to do. The wildlife carer rear those little ones with the ultimate aim of releasing them back into the wild where they rightfully belong. They deserve to be free and to soar through the endless skies showing off their beautiful plumage. Here is a video of me releasing a kookaburra back where it belongs. There is no better feeling than nursing a wild bird back to health and setting it free when the time is right. ← Are you sure you want to breed from your dog? It’s often hard for people to let nature run its course. If it’s helpful to bring in a lost bird, that’s great, but it sounds like very often we end up making things worse by interfering. It’s good that you reminded us of that. I once tried to rescue a rainbow lorikeet that was hopping about in my yard; he couldn’t fly. He let me pick him up but he was infested with mites and I tried to look after him, but he died in the night. Perhaps I shouldn’t have interfered, I don’t know. It’s hard when all we want to do is help. Your post is good advice for us all, thanks Rayya. Great advice, Rayya – most ‘help’ is given with the best of intentions but without any real appreciation of the consequences. In the Pacific Northwest people have a hard time leaving the baby seals and deer alone. What a beautiful bird oh how I pray one day I will get well enough to travel to Australia. Thank you for sharing with us!